Our guests have called them luxurious, amazing, and special. We call them a great place to unwind, relax, and escape. Taveuni Dive Resort has eight bures. Bure is the Fijian word for a wood-and-straw hut, sometimes similar to a cabin. Bures were often dark and smoky, used as a sort of retreat for Fijian men – that’s right, bures were a Fijian man cave. Today, bure is often synonymous with bungalow or other detached hotel or resort structure. Taveuni Dive Resort's bures are far more comfortable than traditional bures. Each of our bures is named after a favorite Rainbow Reef dive site. Each bure is carefully located to balance your need for privacy with easy access to the social areas on the resort grounds, including the Salty Fox Bar & Grill, the pool, and seating areas around the resort gardens. Each spacious room includes a lounge area that includes a small refrigerator, a lounge/couch that converts to a bed, side table, and chairs that most guests move back and forth between the the patio and the interior of the bure. In the middle of the bure is the sleeping area, with a king size bed and benches along the wall to store your gear or baggage. At the rear of the bure is a shower, twin sinks, and the water closet. Each bure can comfortably hold two people, with a third person or children sleeping in the lounge area. We can adjust the bedding to accommodate different sleeping arrangements. As described in the FAQ, The electric sockets in the bures may need an adapter to plug in your electronic devices. The electricity supplied by our sustainable power system is 240 Volt AC (50Hz). Most modern portable electrical devices have built in transformers. However, you should check to make sure your device has a converter, or your devices could be damaged. The resort is not liable for devices damaged as a result of improper use. Taveuni Dive Resort’s bures are unique to the island. Each room is oblong, rounded on both ends and made of concrete with a polished concrete floor. Almost all of the construction materials are local, from within 100 miles of the resort. The rooms are large, measuring ~43 square meters (460 square feet). Louvered windows provide privacy and plenty of ventilation. 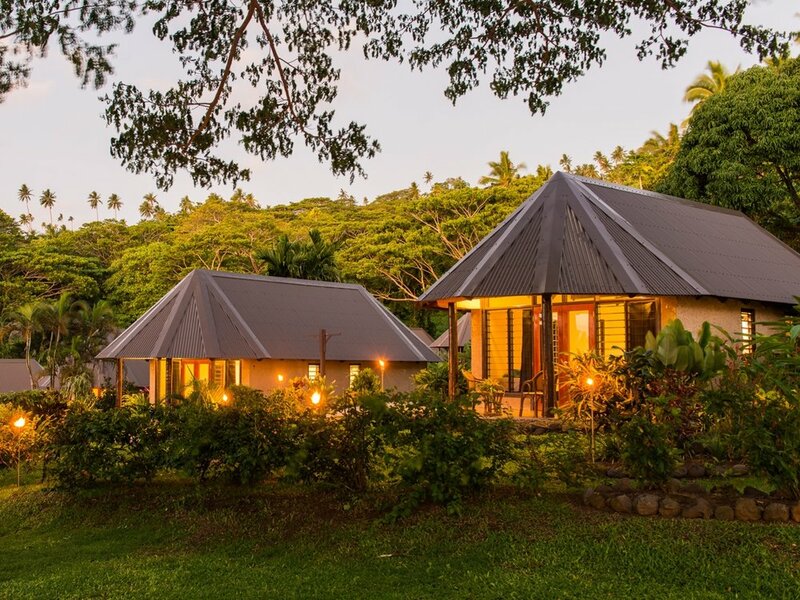 A high open roof is equipped with ceiling fans, and high windows above the shower capture the winds coming off the mountains of Taveuni in the afternoon. Combining this breeze with the ceiling fans and the louvered windows does an exception job keeping the rooms cool. Since we are off-grid, and generate most of our own electricity through our solar system, this natural ventilation eliminates our need for air-conditioning. Hot water is provided by solar hot water heaters equipped with backup electrical element. The result of this construction is an extremely strong, sustainable, low-maintenance structure that is luxurious in the comfort that it provides.